At Gripsholms Värdshus you can enjoy a peaceful stay at the charming inn, relax in the spa area and taste the good food. Mariefred is a cozy destination where you meet a wonderful atmosphere. Take a stroll around the city’s neighborhood or look at Gripsholm Castle. Below you can read more about our different packages for your weekend trip. Gripsholm Värdshus is located in the beautiful county of Södermanland, Sweden. The inn is the oldest and rests on the foundation of a Carthusian monastery. Here we now offer beautiful hotel rooms, all decorated in an individual style. You will find everything from luxury suites with Jacuzzi and fireplace in the bathroom to small cozy romantic rooms. Here we treat all our guests like royalty! The beautiful surroundings of the picturesque town Mariefred invite to lovely walks during the summer. There is so much to look at while in Mariefred. 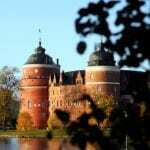 You are close to historic settings like Gripsholm Castle, a church from 1624 and the railway station with its turrets and towers. You will also find a museum railway with old-fashioned steam train that still operates. Here, at Sweden’s oldest inns, our guest have the opportunity to choose from three different restaurants; The dining room, Skänken Restaurant and our outside terrace. This means that you are able to try on classic Swedish fare, exclusive fine dining or English pub food. At Gripsholm Värdshus we serve food with locally sourced ingredients. To make this possible, we adapt our menu after the season. 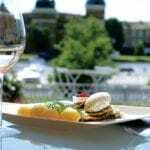 In Mariefred you will find Gripsholm Castle, day spa with treatments, Museum Railway ÖSlJ, beautiful neighborhood, cozy stores, Award winning kitchen at Gripsholm Inn, Deer Park – old oaks and grazing deer and a Golf course. You choose how you want to stay in one of our lavish suites or in a cozy room with exposed beams. Regardless of where you choose to feel at home you’ll be treated like a king. Here you can sleep well in luxury beds. In the morning, you’ll wake up to a delicious Swedish breakfast buffet. Our rates start at 1145 SEK per person, double occupancy and 1300 SEK for one person in a single room.